The following post is written by Kristen Luettchau, one of our Lead Ambassadors. 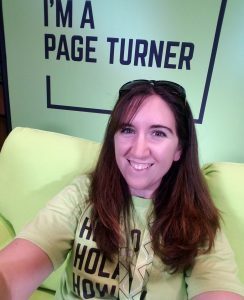 You can visit with Kristen and the other Lead Ambassadors in the NCTE Village lounge right behind the UPS booth in the Exhibit Hall. Walking into the giant Convention Center can be a little bit overwhelming. After visiting registration and picking up the program you might be thinking where do I go from here? Whether you are a first-time attendee or returning it can sometimes be stressful to figure out how to make the most of your convention experience. Today marks the start of my ninth consecutive annual convention. My journey began in 2009 in Philadelphia as a pre-service teacher. The first time I walked into the Exhibit Hall with all of the vendors and books I felt like a deer in headlights. Trying to decide which workshops to attend was daunting because they all sounded so good, especially as a pre-service teacher with little knowledge of how the classroom works from the teacher perspective. Over the years what I have learned to do is prioritize my time. I always spend the first night at convention going through the program and reading session descriptions. The most helpful tool is the icons next to some of the descriptions helping you figure out what level and topic each will cover. For me, I will mostly be focusing on secondary sessions but I will branch out if there is something else I am interested in. If you are attending for the first time a great place to start would be the New Attendee Orientation at 7am on Friday in rooms 222, 223, 226 & 227. At this breakfast there will be returning members there to greet and help new attendees. My fellow Lead Ambassadors and I are here to help you throughout the process and help you make the most of your convention experience. I hope you have a great convention! Say hello if you see me around! P.S. Want that neat sticker at the top of this post? Find a Lead Ambassador!